At this gauge it’s a bit large/wide for my hands, but would fit most, I think. Only two repeats before starting thumb gusset (seems to make it look more unisex) and one repeat after finishing the thumb gusset. 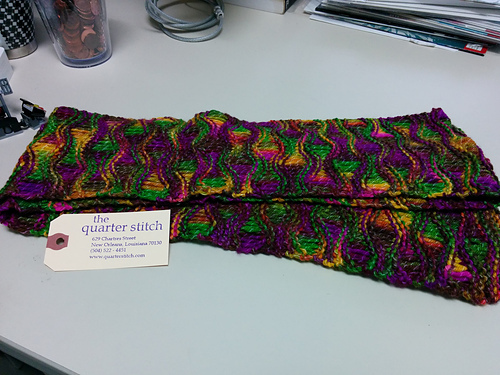 At the end of the gusset increases, knit row 8 in pattern and through the gusset. 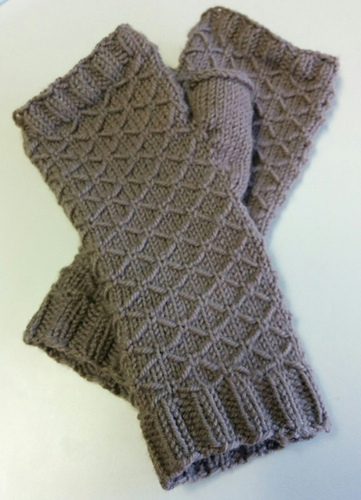 Then knit row 1 in pattern, m1L before the marker, transfer the thumb stitches to waste yarn, m1R after the thumb stitches. I’d used a smidge of the yarn for another project; with what I had left, it was exactly enough yarn. Probably not enough if I’d done all the repeats in the pattern. Maybe with a full skein? But hard to say for sure. Having now worn them once, I think they’d be more comfortable on my hands if I’d done 1/2 a pattern less; they feel a little long. Also, the pattern has a sort of smocking effect, which makes it a little shorter on the outside than on the inside. I don’t know if this could have been mitigated by draping longer lengths for the passed over yarn. It’s also possible that this effect will be reduced over time by wear. Cast on at knitting group on Saturday and got several pattern repeats in, but decided on 1/11 that I needed to start the patterning over again. Ripped back to end of ribbing. Started thumb gusset on right hand. Finished the left hand on the bus, about to start on thumbs. which feels super-pretentious, yeah? but I was moved to it anyway. Can’t believe how lovely, easy, and fast this was! Will definitely make another with this pattern. Wish I’d bought another skein to make something for myself, too.